If you like to make things yourself, you will love the simplicity of making vegan yogurt. I discovered this some time ago through the Sproutman and when I make it I always remind myself to make it more often. I like it that much. The beauty of this vegan yogurt recipe is that the base is made with millet which is like a grain but it is actually a seed. It has been used since ancient times in breads, cereals, and even couscous. This amazing seed is also gluten free. So you can enjoy millet seeds as much as the birds! This recipe will call for soaking the seeds to make a rejuvelac which is a probiotic infused, lemony and refreshing drink loved by many for its wonderful health benefits. The rejuvelac liquid which is full of minerals and nutrients including probiotics which helps stabilize the gut flora which helps with digestion. Combining the cashews makes this drink into a yogurt. When you soak the millet you will ideally want to find a warm to humid area as the temperature of the place you put the millet to soak will "brew" the rejuvelac liquid. Avoid direct sunlight though. The soaking time will depend on the humidity in the home, so anywhere between 12 - 30 hours typically. When you see a little foam or bubbling action occur your liquid is ready to for step 2. The liquid should have a little sour, efervesent smell to it. 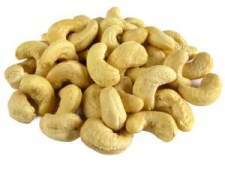 The second ingredient is cashews. The cashews make this yogurt creamy and nutty tasting without adding anything else to the yogurt. You can enjoy this plain or you can add in some flavorings or sweeteners such as honey, agave, berries, vanilla, shredded coconut, etc. the millet to soak for up to 30 hours. If you see a little foaming or bubbling taking place in the jar, this is a good indicator the rejuvelac liquid is ready for the next step. There is not an exact time for when this "action" will take place, it depends on the temperatures and humidity factors in the location of your home. I have found the best place for me is to put the jar in my laundry room. Set 2: Pour the rejuvelac into a high speed blender and add a cup of raw cashews. Blend until smooth and creamy. Place the blended mixture into a clean quart jar and cover with the cheesecloth or paper towel and allow to sit for another 8- 12 hours. The yogurt will thicken and it will have a few bubbles at the top when ready. Refrigerate the yogurt and enjoy it alone, or pour on top of some berries, in a smoothie or make a curry sauce, this delicious yogurt is limitless. 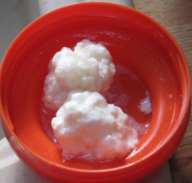 The yogurt will not be as thick as a grocery store yogurt, more like a thick kefir liquid. Now you can see why I pledge to make more of this yummy vegan yogurt. I can enjoy it every day.